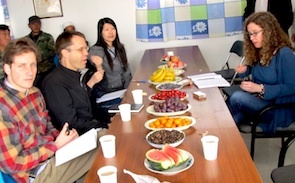 YINCHUAN, China—The morning we travel north from this provincial capital, following the Yellow River to the Nan Liang Migration Farm, Kou Guojiang greets our arrival with a smile and a farm-fresh breakfast. It is April 13, and the bright sun lights a long table set with big purple grapes, miniature oranges, thin slices of watermelon, cherry tomatoes, and crisp red apples so cold they perspire in the warming air. Kuo is the 46-year-old chairman of the Nan Liang farm’s water user association, which supplies Yellow River water to 300 farm families who irrigate and cultivate 200 hectares (494 acres) of corn and wheat. It is the 14th day of the Choke Point: China research and speaking tour, and the first visit by our five-person team to a rural area. Kuo is gracious, clear-eyed, and not at all shy. 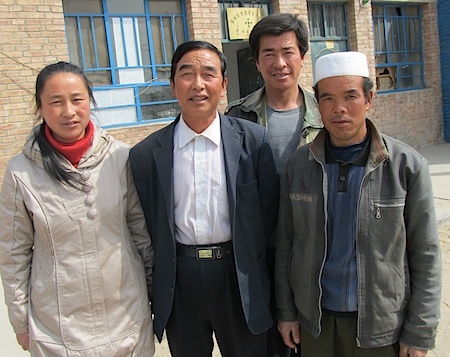 He tells us that in 2003 the government relocated the association’s families from a very dry region in southern Ningxia, where crops frequently failed for lack of moisture. Now he worries that similar conditions are unfolding on the Nan Liang farm, where persistently dry weather and competition from new coal-based industries have prompted government water managers to cut allotments to the association by 10 percent a year since 2008. Yet, despite the diminishing supplies of water and 53-year-old, unlined, water-wasting, sand-filled irrigation canals that transport it to their land, Kuo says harvests have increased. He says that technical assistance from the World Bank and other institutions helped the association’s farmers to increase their harvests, even as they use 30 percent less water. “If we had good canals, we’d be able to save even more water,” Kuo says. Since mid-February, in probing weekly reports from our Choke Point: China series, Circle of Blue and the China Environment Forum of the Washington-based Woodrow Wilson International Center for Scholars have for the first time revealed the increasingly fierce competition between energy and water that threatens to upend China’s progress. In late March, the two organizations arrived in Beijing for the start of a 16-day trip that took three reporters from Circle of Blue and two researchers from the China Environment Forum to Beijing and Shanghai in eastern China and then to Chengdu and Yinchuan, in the nation’s south and west. The tour, supported by the Energy Foundation and Vermont Law School, also included Adam Moser, the China Environment Fellow at Vermont Law School, who joined us at events in Beijing and Shanghai. Much of our time was spent describing the project findings to gatherings of academics, business leaders, scientists, environmental NGO staffers, students and diplomats. Some groups—like the April 11 meeting with environmental leaders at the Conservation International office in Beijing—were small enough to fit around a conference table. The largest event was at Ningxia University, which was attended by 1,100 students and faculty members.